On Friday 10/23/2015 Art Vivant announced a favorable outcome of a legal dispute. In response, management raised the profit guidance and declared special dividends. I took advantage of the subsequent surge in the stock price and sold my position for a +56% gain in two months. STRI was delisted from the NYSE on September 29, 2015 “[…] due to its failure to maintain an average global market capitalization over a consecutive 30 trading-day period of at least $15 million.” Since 09/30/15 it trades OTC. I think the stock price crashed on this day due to indiscriminate selling. On 09/29/15 STRI closed at $0.79. The price subsequently reached a low of $0.37 on 09/30/15, a more than 50% decline in one day without any other news and no change in reporting obligations with the SEC. The price has recovered since then to $0.46 on 10/03/15 but the stock is still one of the cheapest net-nets around. At a discount of 72% to NCAV and an above net-net-average quality of the business, STRI is one of the most attractive opportunities at the time. STRI supplies Ethylene Vinyl Acetate encapsulants to the photovoltaic module industry. I’m not an expert in the solar industry and will not attempt to judge the longer-term viability of STRI’s products and its market position. It appears, however, that STRI is a leading supplier as the company caters to well-known solar companies. I think solar power will be the number one source of energy long-term. However, I will not give this information any weight in valuing this company. This is the same problem an investor faced at the inception of the auto industry, airline industry or the internet. It is one thing to forecast the impact of an industry on society. It is a whole different story to pick the winners and/or project the distribution of earnings and losses. On 12/15/14 STRI announced that Zhenfa Energy Group purchased 27.6 million newly issued shares of common stock (before the reverse-split), representing a 51% interest in STRI for $21.7 million. STRI’s CEO states: “As one of the top solar engineering, procurement and construction companies in China, and a leading solar independent power producer as well, Zhenfa is ideally positioned to directly benefit from the use of STR’s market-leading encapsulant technology and also to advocate its use to Chinese module manufacturers. Zhenfa’s substantial investment reflects their confidence in STR’s ability to become profitable and grow in the rapidly expanding solar industry.” This transaction price can be seen as an indication of intrinsic value as defined by the price a strategic buyer would pay for the business. On 01/02/15 STRI paid out a special dividend of $2.55 per share other than Zhenfa’s shares. On 02/02/15 STRI carried out a 1:3 reverse split. By buying 51% of the company (without the right to receive the special dividend) for $21.7 million, Zhenfa effectively valued the whole business in excess of $42.5 million 10 month ago. At today’s share count of ~18 million, this represents a private market value of ~$2.36/share. Since the closing of the transaction, STRI incurred further losses. These were probably expected by Zhenfa and thus don’t impair the $2.36/share purchase price, which seems reasonable in comparison to the tangible book value of $2.8/share. At the closing price on Friday of $0.46, this translates into an upside of over 400%. Further, STRI plans to close its Malaysian facility in response to its largest customer ceasing operations in Malaysia. Management expects $8 million proceeds from the sale of real estate and $1 million to $1.5 million one-time costs mainly due to severance payments partially offset by proceeds from the sale of equipment. If the liquidation turns out as expected, this would increase my estimate of liquidation value (and NCAV) substantially. In addition, the closure of this facility is expected to improve the utilization of STRI’s other facilities and thus will probably benefit profitability. Despite the recent unprofitability, I think STRI has been acting very shareholder friendly. The company has a history of distributing special dividends, buying back stock and shrinking for the sake of shareholder value maximization. As the new controlling shareholder, Zhenfa is incentivized to maximize shareholder value by returning the company back to profitability. Despite the generally poor evidence of synergy manifestation, I think, in this case, the alliance really could be mutually advantageous. For this investment to be profitable for the minority shareholder, however, one doesn’t need the benefits of synergy. Just a return of the stock price to the current NCAV would render this investment very profitable. Since the transaction, one director bought ~$90k worth of stock between $1.11 and $1.13. Lloyd Miller III also has a position in STRI. His name appears frequently in the ownership tables of net-nets and in case of shareholder abuse, he assumes the role of an activist investor. In summary STRI is an unusually attractive net-net. The company is a leader in its niche. The price is probably depressed due to price insensitive selling in response to the recent delisting. The downside is protected by current assets, especially the large net cash balance (no debt), which is likely to increase substantially due to the liquidation of the Malaysian facility. Historically, the company has been shareholder friendly by distributing excess cash to shareholders in the form of special dividends and share buy-backs. There is a reasonable probability of the company to return to profitability due to synergies and cost cutting. The private market value is around $2.36/share (>400% upside). 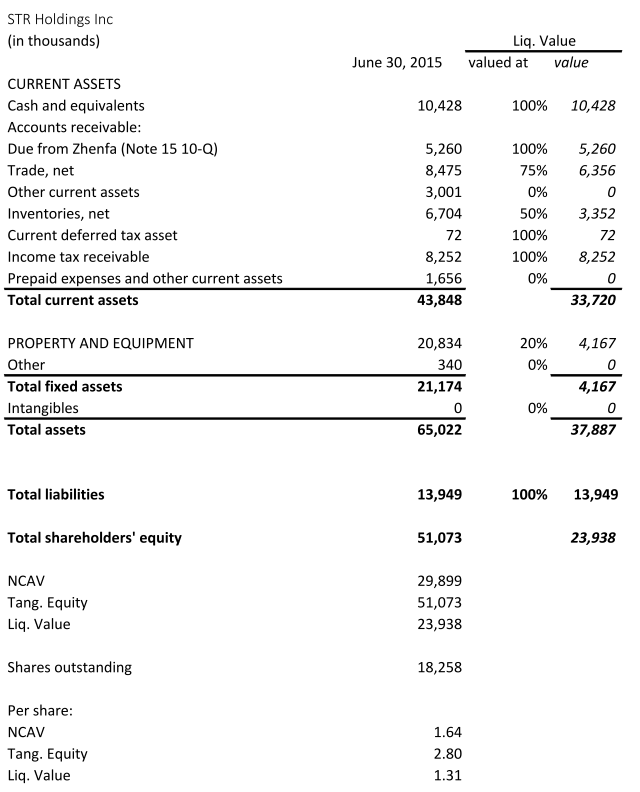 NCAV is around $1.64/share and will probably increase due to the aforementioned liquidation. This situation combines a very large upside potential and limited downside AND an above average probability of a favorable outcome. Disclosure: The author is long STRI. Disclaimer: This article is for informational purposes only and does not constitute investment advice. See: Form 8-K (September 29, 2015), p. 2.